A mountainous cold desert freckled with green patches over a dry weather-beaten face, fascinating valleys, windswept landscapes and quiet villages, Spiti, which loosely translates as ‘the middle land’. The geographic placement passes a heavy influence of Buddhism and stark cultural similarities of the region into the valley. Religion plays a major role in everyday life, testified by the piles of ‘mani’ stones, whitewashed chortens that house Buddhist relics, and prayer flags fluttering relentlessly in thin air. Echoes of ‘Om Mani Padme Hum’ (literally, ‘Behold the Jewel in the Lotus’) by all bring good fortune and prosperity to the distant land. Novelist Rudyard Kipling in his book ‘Kim’ describes Spiti as ‘a world within a world,’ ‘a place where the gods live’ – something that holds true to the present day. 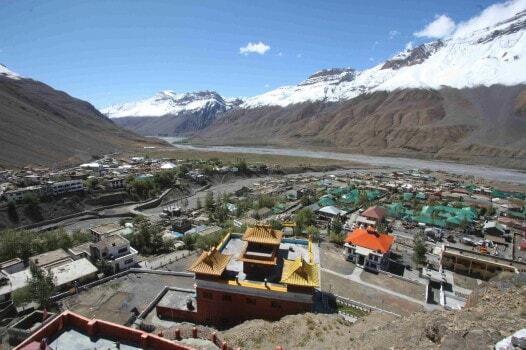 For centuries, Spiti has had an introversive culture where life remained focused around its monasteries. It was loosely ruled by hereditary waziers, a self-styled ‘Nono’, and in between for brief periods, the valley was also attacked by invaders from neighbouring kingdoms. Spiti faced attacks from the warring princely states of Kullu and Ladakh in a bid to control the area. An army from Jammu and Kashmir led by generals Ghulam Khan and Rahim Khan invaded Spiti in 1841 AD. A few years later in 1846, a Sikh army too raided the valley. Finally, East India Company took control of Spiti in 1846 after cessation of cis-Sutlej States on conclusion of the first Anglo-Sikh War. On the ground, nothing changed and the Nono of Kyuling continued to rule as the hereditary Wizier of Spiti. In the last two decades, tourism has caught up fast in the valley that stayed in hides for so long, thanks to the surreal moonscapes, scenic Himalayan lakes and the harsh highlands nourished by prayers at thousand-old monasteries that overlook the grey ribbon of the Spiti River. The glacial stream brings with it an abundance of goodwill and hope of life to the inhabitants. A slice of the moon landed on earth that drapes travellers in its pristine beauty in a way leaving them soulful but never satisfied, such is the charm of Spiti. Get on a winding road leading to the highest motorable village of Komic or a narrow trail in the rugged terrain well-accompanied by stunning landscapes on all sides, and experience the untamed land of solitude and spiritualism first-hand. Language: Natives communicate in Stod Bhoti, a subgroup of the Tibetic languages spoken in the Lahaul and Spiti. Hindi and English are understood and spoken by the people engaged in tourism trade. Clothing essentials: Owing to its high altitudes and sub-zero-temperatures, Spiti remains cold throughout the year. The temperature during the months of May-June barely touch between 15-20 degrees Celsius but in deep winter of December-February it can fall as low as minus 20-30 degree Celsius in some places. April to October is a good time to visit Spiti but always pack some woollens on a journey to this land for the temperature can suddenly drop, making warm clothing essential out there. By September, heavy woollens are recommended as evenings can get really cold with temperature dropping to as low as minus 5 degrees Celsius. Rail: Chandigarh and Kalka are the closest broad gauge train stations for Spiti. Jogindernagar and Shimla are the nearest narrow gauge train stops for reaching this remote region. From any of these stations, rest of the journey has to be done by road transport. Road: From Manali to Kaza, there are regular buses from July to October and from Shimla via Kinnaur, there are regular buses from May to October. Sturdy vehicles used as off-roading taxis are recommended for a travel tour to Spiti from Manali or Shimla. Located at well over 3,000 m altitude high up in the mountains, Spiti welcomes travellers to its postcard-perfect hamlets, surreal landscapes, plentiful trekking trails, ancient monasteries and scenic lakes. The most interesting aspect of Spiti are its monasteries that offer the utmost tranquillity and a glimpse of a living tradition that goes back several centuries. What makes them more fascinating are the colourful murals, vibrant thangkas (religious paintings) and the red robed lamas silently murmuring the sacred chants of Buddha. Low-lit corners of the mud and wood fortresses perched on cliffs exude an air of spirituality. 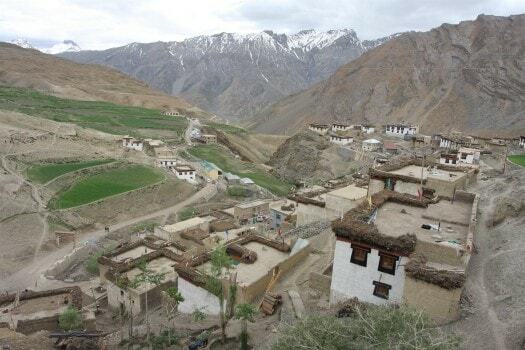 Apart from monasteries, remote villages and wildlife are some other attractions of Spiti. Herds of Himalayan blue sheep grazing and hopping in the rocky terrain can be regularly spotted. The vast expanse around Kibber, one of the highest inhabited villages in the valley, is snow leopard habitat that has put the small hamlet on world map as a wildlife hotspot, offering travellers an opportunity to get a rare glimpse of the big cat in the wild. Weather in Spiti is pleasant from April to October, with the May-June temperatures hovering at a comfortable 15°C and 20°C make it a good time to visit the valley. In winters, the temperature falls to as low as minus 20 degree Celsius. A community celebration and a moment of getting together, Dechhang is celebrated in deep winter in December-January. Feasting and merry making mark the occasion. A three-day long fair, dates of which are decided by the lamas in accordance with the lunar calendar, is usually celebrated in February to mark the advent of the New Year. The prime attraction of the festival at the monasteries is a ritual chham dance by lamas adorning elaborate costumes and masks. Lossar also commemorates the assassination of the cruel Tibetan king, Lang Darma from the 9th century AD. A traditional trade fair that is held every July/August in Kaza is a time when a variety of goods are bartered and sold. Ladarcha is probably the most celebrated festival of Spiti. Earlier, it was held at Kibber village where traders from other parts of Tibet would also gather to barter agriculture produce and merchandise. After closure of the India-Tibet border, the venue was moved to Kaza where it has become a colourful celebration alongside the trading conducted. The platter is dominated by Tibetan cuisine with the Spitian food being an interesting mix of nourishment and fresh flavour. Small eateries and restaurants offer both North Indian as well as Tibetan food. Green patches in the valley sway with barley, which is the biggest source of food. The grain and roasted flour is used to make local dishes like thuktal and shunali. Other local food items travellers should not miss include momos and thukpa prepared in Tibetan style. For tea lovers, Spiti has flavoured and aromatic teas such as butter tea, lemon, ginger, honey tea on offer. Spiti has limited medical facilities though the Community Health Centre at, Kaza, the Primary Health Centre at Tabo and the Civil Dispensary at Kibber cater the locals well. Spiti is connected with the outer world only by road transport. Traveller have the option to enter Spiti from two sides, one through Shimla and the other from Manali. State-run buses and private taxis can be booked from Shimla and Manali that take about 12 hours to reach Kaza, the sub-divisional headquarter of the valley. Indian citizen don’t require a permit to enter the valley. However, foreign tourists entering Spiti through the Shimla-Kinnaur route do require inner-line permits as this route takes you very close to the Tibetan border. Permits can be obtained at the Inner Line Permit Office at Reckong Peo, Kinnaur. Network connectivity in Spiti valley is not very good. Owing to its remoteness and high altitude only BSNL mobile phone network works fine in Spiti. Internet speed is slow. 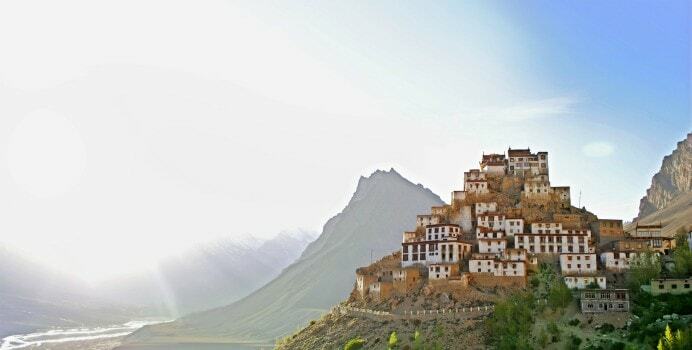 A small and secluded village in the heart of Spiti, Tabo is famous for a monastery which is over a thousand years old. Founded in 996 AD, Tabo is the largest monastic complex in Spiti comprising of nine temples, 23 chortens, a monk chamber and a nun’s chamber. The village, with sprawling apple orchards is in the middle of a cold desert around. Across the monastery, on a mountain side are a cluster of caves that are said to have been used by meditating monks for months of solitary confinement. The monastery has amazing galleries of wall paintings and stucco statues. There is also a recently added new chamber where most of the daily chanting and prayers are held. Between Tabo and Kaza, on a 7 km branching road from the village of Schichling, Dhankar monastery dramatically hangs on a cliff side on the left bank side of Spiti River. In local language Dhankar means a fort and the monastery was indeed used to guard the valley from outside invasions. Because of its strategic location, the monastery served as a castle for the Nono, the de-facto ruler of the valley. The whole complex speaks much about building and engineering skills of the Spitians. 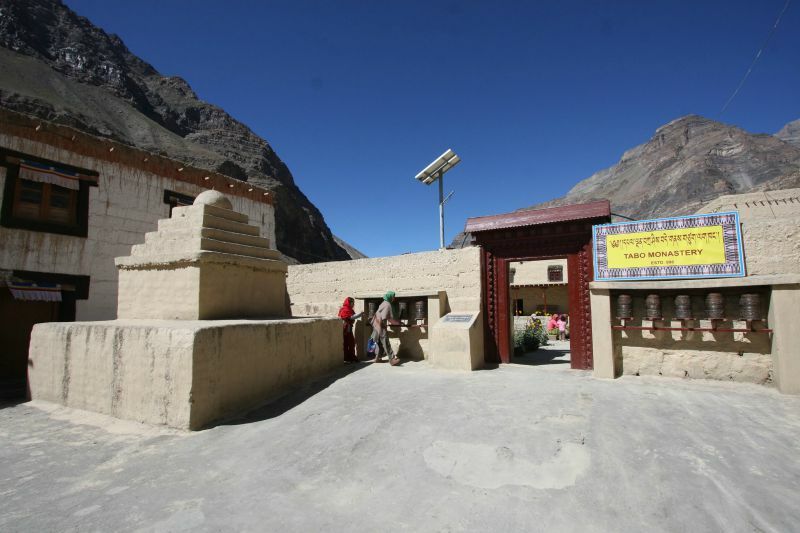 Dhankar monastery at an altitude 3370 m is a repository of Buddhist scriptures in Bhoti script. It also serves as a base for excursions to Dhankar Lake and Pin valley. The administrative headquarter of Spiti, Kaza is the largest settlement of the valley. Situated on the left bank of Spiti river, narrow streets of the small town lead to the marketplace which has some restaurants. There is Bank, ATM, Post Office and a petrol – diesel filling station at Kaza. Being a good base to exploring the region, the famous Key monastery and remote villages including Langja, Hikkim, and Komik can be easily reached from here. Perched on a volcanic-shaped hillock, Kee monastery is a collection of faintly lit rooms and a maze of dark corridors leading to different sections of the complex. Age-old wood columns and small flights of stone steps that surrender in front of heavily carved wooden doors leading to the prayer chambers have exhibits of rare thangkas, murals, and several ancient musical instruments. A library contains manuscripts of sacred Tangyur texts. Apart from the cells occupied by the monks, the Gompa has a large assembly hall and chamber that is lined with religious paintings. The chamber of the incarnate abbot Zim-chung is the highest point of the complex. 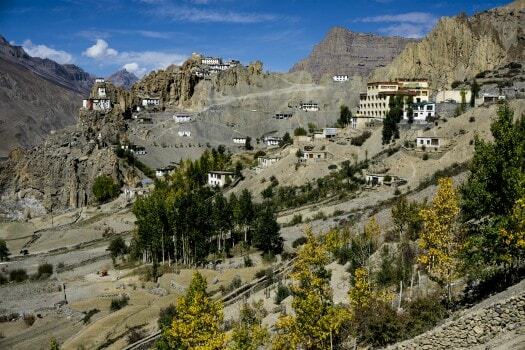 The monastery is only 12 km from Kaza. Only 6 km from Kee village, Kibber at an altitude of 4205 meters is one of the highest inhabited villages of the valley. It also acts as the base for several high altitude treks. The Kibber Sanctuary, spread across 1400 sq. km lies past the village and is a habitat for blue sheep, ibex and snow leopards. 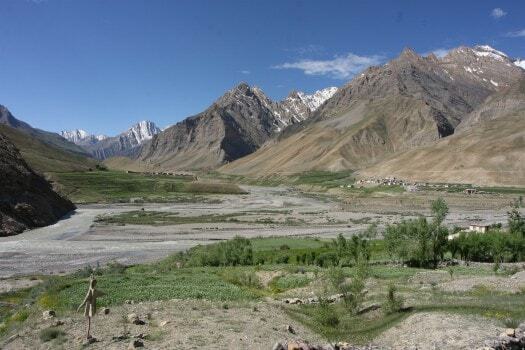 From Kaza, a state-run bus service plies to the village in summers. The moment you reach here, you are greeted by lush green fields and houses with resembling facades that create a beautiful contrast against the arid backdrop of lofty hills. There is a civil dispensary and a post office at Kibber. From the confluence place of Pin River with Spiti River, at Atargoo, 10 km from Schichling village, a narrow road leads into the valley carved out by Pin. At its origin the river is fed by the Kungri glacier. The valley has several monasteries which includes the Kungri monastery and several others located in the scenic village named Mud. From Pin Valley several tough trekking routes head out which pass over the Pin Parbati Pass. One trail gets into Kullu valley, while another one through Bhawa valley leads into Kinnaur. The entire Pin Valley is a National park where over twenty species of rare animals and birds including the endangered snow leopard are sheltered. Other wildlife sighted in the sanctuary are the Ibex, Bharal, Red Fox, Marten, Weasel, Snow Leapord, Bearded Vulture, Chakor, Golden Eagle, Griffon and Himalayan Chough Weasel. Chandra Taal, meaning ‘Lake of the Moon’, is a deep blue crystal clear water body high up in the valley hollowed in an attractive crescent shape. North of Kunzum Pass (4,590 m) – the gateway to Lahaul from Spiti – this picturesque lakes beauty is legendary. It’s an ideal pastoral countryside when a carpet of meadow grass covers the slopes and shepherds lead their flocks to graze in spring and summer. Though there is a 14 km-long jeepable road that branches from the Manali-Kaza road at Batal to the lake, but a better approach is to undertake a 2 hour level walk from Kunzum Pass. The lakesides are ideal summer camping grounds where bedded tented accommodation can also be availed from June to October. The lake is a very popular among trekkers and campers. Guru Padmasambhava credited with having spread Buddhism into Tibet is said to have found the Kungri Monastery sometime in the 14th century. It belongs to the Nyingma sect and is considered as one of the oldest residential monasteries of Spiti. Spread over three blocks, the Kungri monastery is a favourite among scholars, pilgrims, and tourists who want to stay back for months or longer, to live the life of a monk without disowning one’s own religion. The monastery has a prized collection of over 380 thangka paintings and many old relics. A traditional ‘Devil and Sword Dance,’ performed by the monks in July every year is a good time to have a glimpse of the religious life of the community. The monastery is 3 km from Gulling village. A village guarded by a huge statue of Lord Buddha gazing at the trans-Himalayan ranges dominated by the snow-capped Chau Chau Kang Nilda peak, Langza is best known for ammonite fossils, clay pottery and handcrafted carpets and shawls. Livelihood of people who live in mud houses is dependent upon handicraft and agriculture. Trails breaking out from here village lead to some very scenic high-altitude lakes around the village. A tarred road that goes past the village gets to Komic – one of the highest villages at 4400 m to be connected by a motorable road. Hikkim, the highest habitation of the valley can be reached from Komic.